Of the 63.2% of Top 100 Retail Franchises that provide an online presence on the brand’s main site to their franchisees, only 42.9% actually offer them a full website, often with e-commerce capabilities. 41.4% of leading retail franchisors only provide a “single page” type of presence, many of whom barely qualifies as real value, albeit often limited, with outdated or incorrect information. 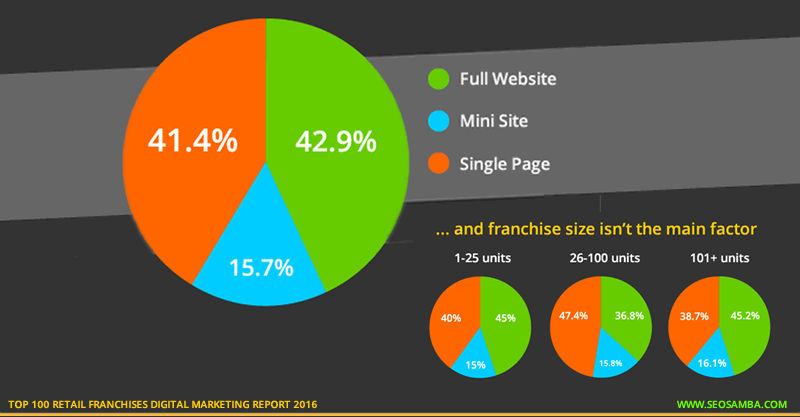 15.7% of Top 100 Retail Franchises are offering at least a multiple-page presence for their franchisees – aka “Mini Sites” - with basic localized information but no e-commerce capabilities. The type of website provided under the umbrella brand does not depend on the overall size of the retail franchise company, further hinting that franchisee visibility is a matter of strategy, not overall budget. By providing full websites themselves, franchisors can enjoy higher marketing fees, lower maintenance costs and a consistent brand identity across the board. For potential franchisees, out-of-the-box branded franchisee websites are often a decisive onboarding factor in the more competitive markets. Thanks for reading this summary. To uncover more data, stats and findings as well as our analysis of how these facts impact the overall online strategies of leading franchisors, please click the button to download for FREE the full version (PDF) of our Top 100 Retail Franchises Digital Marketing Performance Report 2016.